Expedition 30 commander Dan Burbank of NASA, flight engineer Don Pettit of NASA (left) and European Space Agency flight engineer Andre Kuipers (center) discussed the progress of their mission on the International Space Station in a news briefing on April 11, 2012. California-based Space Exploration Technologies, or SpaceX, is scheduled to launch its unmanned Dragon capsule to the space station on April 30 on a groundbreaking mission to rendezvous and dock with the orbiting outpost. If successful, SpaceX will be the first private company to accomplish the feat. Spaceflyers Don Pettit, of NASA, and Andre Kuipers, of the European Space Agency, will be responsible for using the space station's robotic arm to grab the spacecraft and attach it to a parking spot on the Earth-facing side of the outpost's Harmony node. 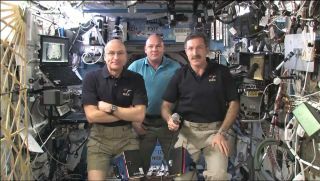 "We're just now starting to get up to speed on training for this event, and we have two primary means of training: fly the actual arm … and then right here, we've got two space station computers which double as an arm simulator," Pettit told reporters in a news briefing Wednesday morning (April 11) from aboard the space station. The special software replicates the trajectory of the Dragon capsule, and the arm controls allow the astronauts to practice robotically latching onto it. "It's a really neat capability," Pettit said. "I have it set up now all the time. I'll get up in the morning [and fly] track and captures with a bag of coffee in my mouth and cinnamon scone in my hand." SpaceX is one of two commercial companies with NASA contracts to launch new unmanned cargo ships to the International Space Station. SpaceX has a $1.6 billion contract to provide 12 Dragon cargo missions to supply the station crew. The Virgina-based company Orbital Sciences was awarded a $1.9 billion contract to provide eight launches of its cylindrical robotic spaceship Cygnus to stock up the station. The first Cygnus test flight is also expected some time this year. A magnitude 8.6 earthquake struck a region of the Indian Ocean off the western coast of Sumatra yesterday (April 11). From their orbital perch, space station astronauts often photograph natural disasters or severe weather systems for scientists to use on the ground. But with the flurry of activity in orbit, the space station residents had been unaware of today's Indonesia quake. "We have not heard about that, and hopefully it's limited in its impact to folks in that area," said space station commander Dan Burbank. "From our perspective here onboard the space station, there are certain times when we have the opportunity to see the results of tsunamis — results of natural disasters." Burbank added that mission controllers on the ground will likely look for opportunities for the spaceflyers to capture views of the region later today. North Korea is also poised to launch an Earth-watching satellite atop a long-range rocket as early as today (April 12). The controversial rocket launch has been condemned by several nations who claim the launch is a disguise for testing military missiles. The launch is scheduled to occur sometime between April 12 and April 16. "I'm aware a launch is being prepared," Burbank said. "Beyond that — the specifics of the launch — I, for one, am not aware of any of the details."